Building thousands of homes along with new infrastructure could be the way forward for the borough, according to the council’s Local Plan. The document outlines plans to accommodate 12,400 houses over the next 15 years, including an extra 2,800 properties to make up for a shortfall in Coventry. As previously reported in the Advertiser, Rugby Borough Council has identified its ‘preferred options’ and is asking for public feedback before the February 19 deadline. The proposals include 5,400 homes to the south- west of the town, near to Bilton, Cawston and Dunchurch. > 855 houses at Coton Park East. > A southern relief road to ease traffic congestion. > Up to 150 homes at Coton House, off the A426. > 100 dwellings each in Binley Woods, Brinklow, Long Lawford, Ryton on Dunsmore, Stretton on Dunsmore, Wolston and Wolvey. > A new village of 1,500 houses on land south of Walsgrave Hill Farm. 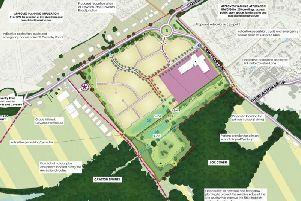 The plans have already drawn criticism and Dunchurch Councillor Howard Roberts has set up a petition against the proposed developments, while Bilton residents held a meeting last night (Wednesday) to air their concerns. But Cllr Heather Timms, Rugby Borough Council portfolio holder for economy, development and culture, said the potential developments would provide many benefits for the town. “The Local Plan is extremely important and that’s why we’re trying to involve everyone in the consultation and get as many responses as possible,” she said. “It can change and probably will change as a result of the consultation and I am really pleased that people are talking about it. Some Advertiser readers have expressed concerns over the potential increased demand on the Hospital of St Cross. Cllr Timms said: “I think these developments will make the Hospital of St Cross stronger. Rugby is growing and that makes University Hospital Coventry and Warwickshire Trust see how important St Cross is and how much demand is here. A number of public meetings have been scheduled to discuss the Local Plan. David Wilson Homes’ application to build more than 800 houses on land off Ashlawn Road was refused by the planning committee last night (Wednesday) on grounds that it would cause traffic problems and air pollution. But the land has been identified as a potential development site by the borough council’s Local Plan and protest group Stop Ashlawn Road may have another battle on their hands if the land is given the green light.